There are multiple ways in which you can interact with your students or collaborators, in this section we will present some features that you might find useful when managing a course. You can create general real-time chatrooms for your CoCalc projects. You can create a project chat room by clicking on the New button, this will create a file with .sage-chat extension. In addition, every file in CoCalc has a separate chat that can be found on the upper left corner of your screen. 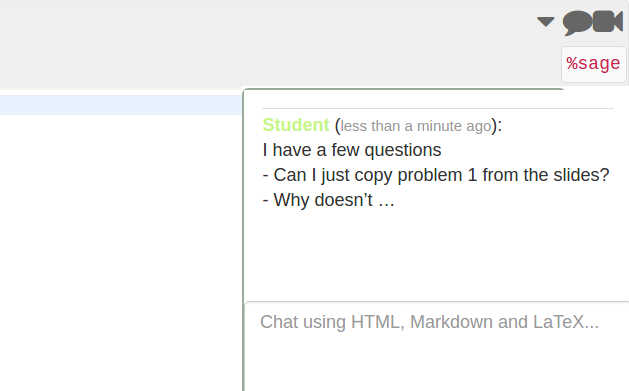 Every time one of your students writes something into a chat on any one of their files, you will get a notification displayed on the top bar. Clicking on the notification button (bell icon on the top of the screen) displays a notification menu with the latest chats and modifications in the project or specific files. The chat notifications are always presented at the top of the menu, followed by any updates you or your collaborators have done to the project. Clicking on a chat notification will take you to the student’s copy of the file inside his/her project. From there, you can both reply to their questions and look at their work simultaneously. Once you have replied to the student’s question (s)he will receive a notification. Multiple users can collaborate on a project. As soon as a collaborator is added to a a project (see Creating a new course) they share both the project and the associated files. 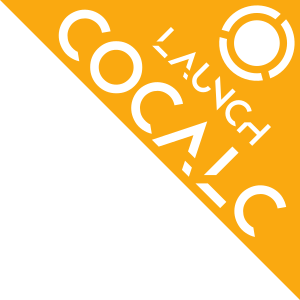 Live collaborative editing is possible in CoCalc. If one of your collaborators updates a notebook, the rest can see the changes as they are being made (similar to Google Docs). CoCalc chats support an @mentions feature, where you type @ and a list appears of collaborators, which you can select from. Anybody mentioned there will get emailed (unless they are mentioned again in the next few hours, since we don’t want to spam people). This helps ensure people know about chats. Any chat will cause the notification count to go up in the bell in the upper right, whether or not you are mentioned. You can create a common shared project for your course. Think of a shared project as your private course website for the students with automatic forum and code support. By default everybody (collaborators and students) will have write access to the project and its associated files. To create a shared project you need to go to your .course file and click on the Shared Project button. If you create a .sage-chat file here, all students will receive automatic notifications when questions are posted on the chat. If you want to make a file or an assignment read only so that students cannot modify it, you need to modify the file permissions. Launch a terminal and type chmod a-w filename (in this example the filename is Assignment1 ). If you want to check the access permissions of all the files contained in a given directory, use the command ls -l on the terminal. In case you want to change a read only file into a read and write, type chmod a+w filename on the terminal. Have someone in each group make a project with all the group members as collaborators. They will all then be able to collaborate on the same project and modify files simultaneously. You should note, however, that by using this approach you cannot automatically collect assignments from the team. A workaround could be creating an assignment in your main project and having the students copy that file to their group project. Students can collaborate from within their individual course projects using [Git] via the terminal in CoCalc. See Using Git in Tips and tricks.